The deeper south we drove on the Baja Peninsula, the more impressed we became with the beaches, people, and well, I'll be a little nerdy here, the memories and bonds that were forming. Yes, sometimes we felt we needed to be on our toes (even here, perhaps),but it's clear we have fallen cautiously in love with Baja. There is a little bit of mystery to Baja, some dirt and grime, and maybe a tiny bit of hesitation in some situations. Combine that though with the stunning landscapes, friends we're traveling with and meeting, and the incredible experiences we've had and you've got one of our favorite parts of our year "hitting pause". So join us as 'we hit Paz' (Chip's proud contribution to this blog post!) and drive further south where we discover stunning streches of beach, snorkel alongside the largest "fish" on the planet, and stumble upon new friends who help us discover the volunteer project we've been searching for all year! In our previous post, we had just split from one of my most cherished sections in Baja - Bahia de Concepcion & Loreto (if you haven’t seen/read it, YOU MUST, & HERE!). We were slightly apprehensive to leave these sheltered areas because we had heard that La Paz is the more dangerous area to visit in Baja. La Paz is the city on the news that is announced preceding details about shootings, violent crimes, drug cartels, and homicides. This is not the place you want to tell your parents you are going to be visiting. With their grandchildren, might I add. We tried not to let the media paint this portrayal of La Paz but how could it not freak us out when it’s common to read a quote from a newspaper article stating: “Now, [Baja Sur] is one of Mexico’s most deadly on a per capita basis.” Our guards were up as Spud rolled into town, and I’ll admit, we didn’t fully let them down the entire week. 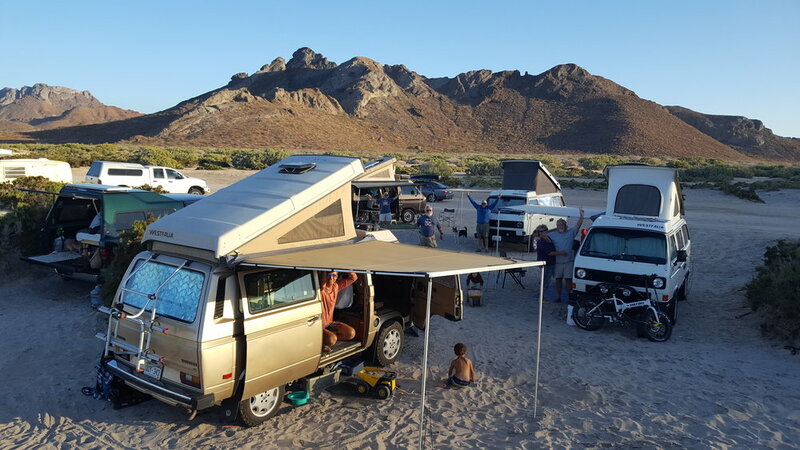 After another beautiful drive alongside jagged mountain ranges that rival some of our all-time favorites, we landed north of La Paz late in the day at Maranatha Campground with our crew of four Westfalias, a truck camper, and a Casita. Maranatha had everything we fancied with the perk of it being just outside the city if we wanted to buzz in, walk the malecon, or buy the notorious baja ponchos - which, of course, we DID. A sizable playground was right out Spud’s sliding door, the grounds were expansive for exploring with dump trucks, we splashed around in the newly remodeled pool one entire hot afternoon, our laundry hung crisp and clean from the clothesline, there was decent WiFi, and the showers were piping hot with a bonus of it having actual water pressure (hallelujah!). Our intention was to stay one night but we settled in for three comfortable days (partly due to the light rain that moved in on the La Paz area). The campground had also welcomed a large volunteer group that week which was helping with general maintenance of the grounds and were building a church in one of the nearby communities. We quickly learned that these folks had big hearts, often checking in on us and bearing colorful crafts of the day for the boys to create. After talking one afternoon to a few of the women, they inspired and encouraged us to look up their volunteer opportunities online. I promptly jumped on the internet, and after nine months of searching for volunteer work on the road, finally found one that would be the perfect fit for our family (you wouldn’t believe how hard it was to find one for a young family of four)! We have these kind people to thank for our upcoming volunteer project at Camp Yavapines in Prescott, Arizona (You can read about that experience here). The jibs playing hide and seek! 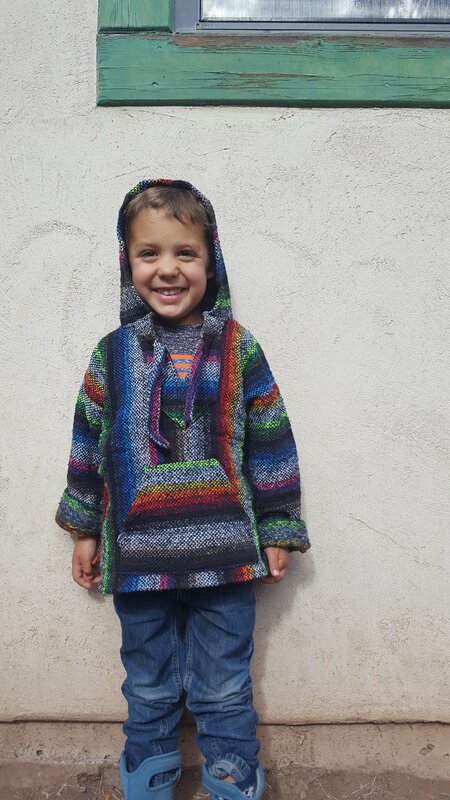 One of the two awesome Baja ponchos we bargained for! Inviting Goonie to the top bunk! Tecolote Beach, outside La Paz, Baja. After the rain ceased we packed up the vans, waved a bittersweet goodbye to our friends at Maranatha Campground, loaded up with groceries at a fully-stocked Walmart (unlike the states, I love BAJA WALMARTS! ), then buzzed out to Tecolote Beach. We spent a couple glorious days with the vans backed up to the miniature sand dunes. As you can see the crystal-clear turquoise ocean was at our disposal the WHOLE time. We swam, cooked fresh food, enjoyed the remaining days with our van-family, flew kites, babysat van-kitties (wait for it…), and just plain ol’ bagged some rays. What is so wonderful about this beach is its isolation from the surrounding city of La Paz. With it being 25 km outside of the city limits, we received a much needed respite from crowds, cell reception, and highway noise. Set up along the sea are a couple quiet restaurants, a row of evenly spaced campers, and a shop that rents out ocean toys. Can you tell from the overload of photos that we enjoyed the seclusion? Summing up Baja life in one photo…sipping vino, watching jibs with trucks, and listening to the gentle crash of ocean waves. Hi everybody!! Can you spot everyone in our group?! Fresh everything! Thank you, honey! A few minutes drive from Tecolote lies an even more striking beach, named Balandra Beach. We stopped here briefly to soak in the views while enjoying peanut butter and jelly sandwiches with a side of canned cream cheese stuffed jalepenos. Just trust us, you must buy these delectable goodies when in Baja. Yes, at Walmart. Following our lunch, we waded through the calm, shallow, crystal clear water and I’ll admit, I didn’t want to leave. If only they allowed camping here (which supposedly you CAN get away with). Anyone Want To Swim With Sharks Today? We celebrated our last couple weeks in Baja with a reunion with Chip’s med school classmates and a visit from family. You’ll see most of those fine people on the next blog post when we venture down to Todos Santos. While we were ready to say adios to the La Paz area (we were slightly on edge here), there was one last bucket list item we just had to fulfill. The group of friends that met up with us had every intention of taking full advantage of their vacation and planned an epic day of snorkeling with whale sharks that we obviously could not pass up! Thank you, friends! Every winter in the La Paz Bay (& around Mexico), whale sharks arrive from thousands of miles away to feed on abundant amounts of plankton. Because we weren’t confident on the answer, I’ll share with you that the whale shark is actually a slow-moving, filter-feeding shark and the largest known fish species in the world. These gentle giants—which can reach up to 40 feet or longer in length, and weigh an average of 5 tons—use mouth filters to feed on tiny plankton and small fish or eggs. Learning this, our worries eased about swimming with sharks but more so about having to jump into the chilly offshore water on a cloudy day (fun fact though…cloudy days make for better visibility!). We wet-suited up, hopped on our boat, and motored out into the heart of the bay. The anticipation was building and when our boat was finally allowed to enter the area where the sharks were roaming (only a certain number are permitted at a time) we began to prep the snorkel goggles with (ocean-friendly) dish soap. Our guides typically spot them by locating the shark tip poking above the ocean (eerie!!) or from a guide in a nearby boat. At last, one was headed our way so the first group of four flung themselves into the frigid ocean. Not more than forty feet from our boat was a whale shark gracefully and slowly cruising along with its mouth open wide (thankfully not directed towards us). We were lucky enough to journey right alongside (see Chip’s video below). Being up close and personal to yet another giant creature in its natural environment in Baja was awe-inspiring. And if you didn’t catch us meeting our newest friends, the gray whales, then you must check it out here! That meet and greet has surpassed anything we did in all of Baja! We finished up our day in La Paz with some INCREDIBLE fish tacos! Check out these toppings! Chip and Matt ready to meet the biggest fish in the sea! Just a little snorkel with a WHALE SHARK. No big deal. We’ve said it numerous times before, and I’m sure we’ll say it numerous times more but the people, you guys. The people make this journey we are on exponentially better! Every day, every place, every blog post there are people we meet that have dramatically shaped our trip into what it is. Whether it’s family, or friends we haven’t seen in ages, or a bunch of unknown van-driving people we meet up with in the parking lot of a casino the night before we’re supposed to drive into a foreign country (eh um, below…). We admit we are blessed to have met yet another incredible group. For the last month in Baja we traveled on and off with the folks below (and a couple more that parted ways earlier). Yes, we were the youngest. The only family with kids along for the ride. But it didn’t matter. I won’t forget how well we all jived, how nice they treated us and our boys, and how comfortable it felt traveling through this country together. Thank you, sweet friends, for letting us tag along on the Baja ride of a lifetime! Just your average Baja scenery. -Caravanning with Brad and Shannon.